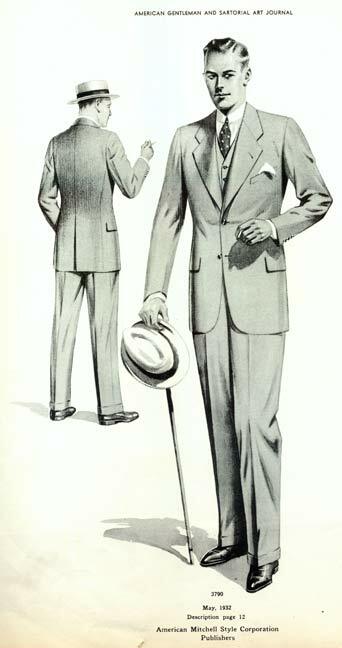 Historic fashion for men tends to get short shift, in comparison to the discussions of women’s fashions. Perhaps because the costuming world tends to be a bit gender tilted towards women. 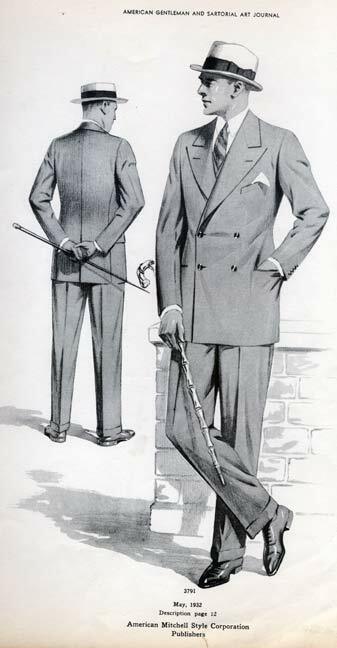 Today I address that a bit with the first in a series of posts about the world of gentleman’s clothing. The masthead above is from a publication dated May 1932, and originally published by the American-Mitchell Style Corporation. 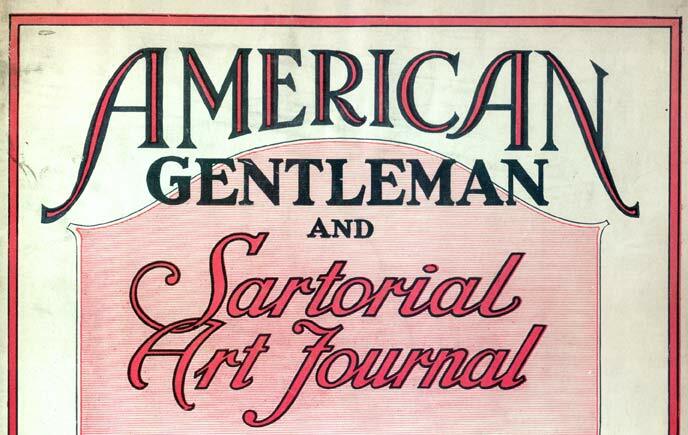 The magazine was part of a larger company (The American Mitchell Fashion Publishers) that produced many books and periodicals about the art of tailoring. The earliest editions that are in the archives date from 1913 – but they most certainly produced books prior to then. According to the May 1932 issue they were located at 15 West 37th Street in New York. But by the May 1934, the company is listed as the American Gentleman Publishing Corporation, located t 1133 Broadway in New York. Material is a pearl gray tweed suiting. The coat is 30-1/2 inches for a man of average height. The shoulders are of natural width and finish. Gorge is cut rather low. The lapel notch is cut slanty and measures 2 inches at the notch and 11-1/2 inches to the top button. Collar measures 1-3/4 inches at the notch and the same at the back. The back is well shaped an draped over the blade and has a center vent. Fronts are made up soft with no hair cloth and quite chesty. Lower pockets have flaps. Breast pockets are finished with a welt. Edges are single stitched close and the seams are plain. Sleeves are finished with an open vent and four buttons. The waistcoat and trousers are the same as explained on the next figure. The material is a light Cheviot suiting. Coat length is 30 inches for a man of average height, 5 feet, 8 inches. Shoulders are of natural width and finish. The Gorge is of medium depth. Lapels are peaked, measure 2-3/4 inches at the peak and 13-1/2 inches to the top button. The back is quite shapely, but easy fitting and has a center vent. Front is quite chesty and closes with two buttons. The upper buttons are 5-1/2 inches apart and the lower buttons are 5 inches apart. Pockets are piped. The breast pocket is finished with a welt. 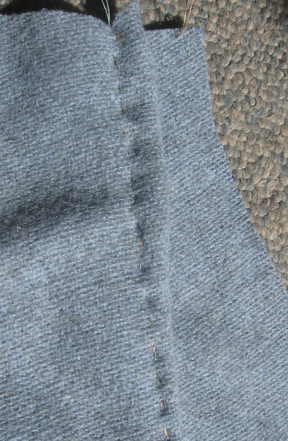 Edges are single stitched close and the seams are plain. Sleeves are finished with an open vent and close with 4 buttons. The waistcoat is single breasted, no collar. Fronts are made up with 6 buttons but only buttoned on 5. The bottom is well dipped. The trousers are natural fitting over the hip and thigh, and measure 20-1/2 inches at the knee and 18-1/2 inches at the bottom. The bottoms are finished with a cuff. 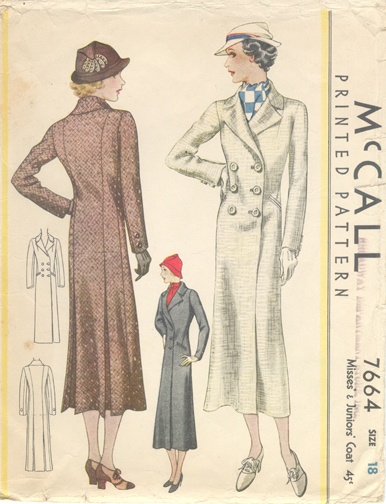 There are several pattern drafts in this issue, including a double breasted woman’s overcoat – very similar to this pattern currently in progress. The only difference being that the magazine draft has pockets with a flap – whereas the McCall’s pattern has double welt pockets. At some point prior to 1945, the Mitchell magazines and publications were bought by the Master Designer Publishing company in Chicago, Ill There is an indication that they were publishing tailoring books as late as 1992. A quick internet search turned up nothing current on them – so I am unsure if they are still in business or not. If anyone has further information – please post in the comments section. I will be posting up soon a series of pattern drafts from these magazines! Watch for the next post in the series. I was hoping to get the next section about the Traveling Jacket posted, but I got a bit stalled out in the pattern alteration phase. I will be posting up the information about the pattern alterations in the next day or so. In the meantime, I thought I’d let you know about my current sewing project – a 1930’s coat. It has that classic “Casablanca” look to it, and I love the long length with the box pleats falling from the waist at the back to the hem. Another interesting design feature is the long dart that comes in from the underarm and angles down towards the pocket. (You can see a bit of the dart if you peek closely at the right hand side of the white coat. There’s a little angled shadow that’s center and just above the double welt pocket – that’s the dart. Now – if I could only find a pair of those brown shoes shown in the left illustration! My old coat was black, so I decided that for a fabric I wanted something a bit different. I wasn’t sure what, one of those I’ll know it if I see it things. I also knew that while Britex Fabrics would be the number one choice for wool – I didn’t want to pay 250.00 a yard for a full length coat. I knew if I even browsed over there I would fall in love with something much beyond my budget. Instead, I went to Discount Fabrics in Berkeley, CA. Which is a great place, if you don’t mind spending a couple of hours in there browsing. It’s rather like a fabric treasure hunt, and if you find something you like, snap it up — because there’s no telling if it will be there the next time you come. It took me a bit to track down the woolens . . . and while the selection wasn’t nearly as huge at Britex . . all of it was lovely stuff. I found what I was looking for. 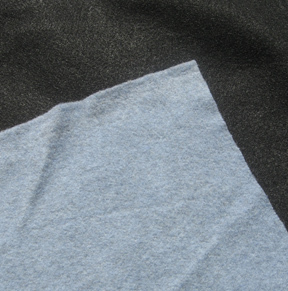 A blue-gray Italian wool, with a very slight pile surface. It was a bit lighter weight than I was looking for, but the canvas and other structure inside should give it more body. The fabric is 60 inches wide, 100% camel hair wool, and ran about $ 55.00 per yard which means it would have run anywhere from $ 100.00 – $ 150.00 a yard anywhere else. You can’t really see it in this picture, but it has little flecks of pale blue, pale and medium gray in it. I made a muslin first, using Nancy Zieman’s book Pattern Fitting With Confidence. (This is a reissue of her earlier book Fitting Finesse.) 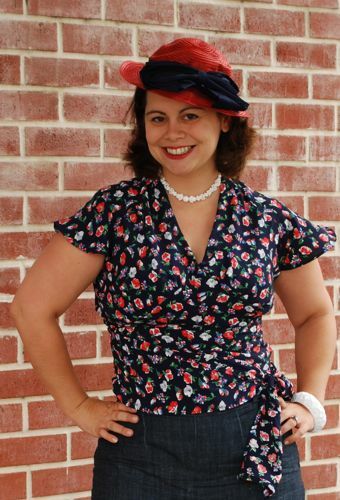 I’ve used this primer for years to alter vintage patterns to fit me – and highly recommend her method. I ended up having to adjust through the waist and hips for my extra inches. and having to widen the upper sleeve to for my more “fluffy” upper arms. I also decided to raise the neckline lap at the center front a little higher – since one of the things I hate is wearing a coat where the cold air is whistling down my front! The muslin only needed a few little tweaks in class (hooray for Nancy Zieman!) 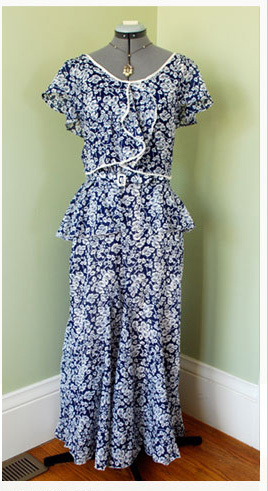 — one of which was to open up the shoulder seam a little more to allow for shoulder pads. Unfortunately I can’t show you the finished muslin – because I’ve already taken it apart to use as the pattern for cutting the coat. But trust me . . even as a muslin . . . it looked SHARP! I decided to do everything in classic couture tailoring methods, which translates into lots of hand work. I went through and chalked all of the markings, and then thread basted everything . . . and I mean everything with silk thread. All of the thread marking didn’t take nearly as long as I thought it would – and there was a sort of zen quality to plying needle and thread through buttery soft wool. 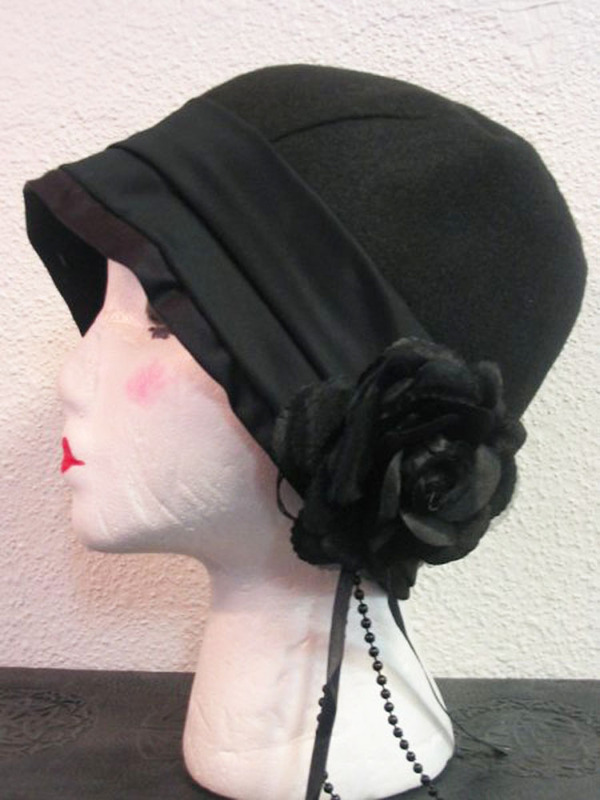 The refresher course at Apparel Arts helped get my brain in motion – but some of the techniques were a bit modernized for what I wanted to do, such as machine stitching rather than pad stitching being used for the collar. Don’t get me wrong – for current tailoring these options work great, and are amazing time savers. 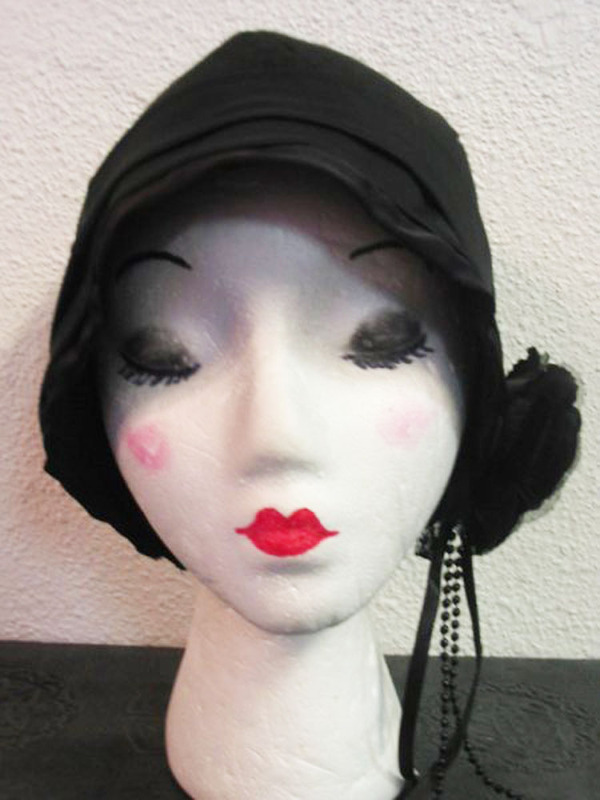 But having chosen a vintage pattern, I wanted to do something a lot closer to what would have been done in 1933. So – my next step was off to research the Library’s vintage tailoring books! Part two of this series will cover constructing the darts, making the double welt pockets . . . and what my tailoring research turned up. My next post will cover sewing the darts and the double welt pockets. What a great way to start off the spring! 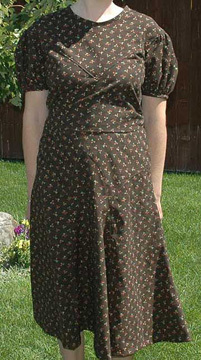 This wonderful dress made up from pattern # T7746 looks like just the thing to enjoy the warm weather! You can read up on the details of the construction: HERE! What a surprise to open up the mailbox today and find several new photos of garments made from the VPLL patterns! First this lovely version of pattern # T7357. I have been wanting to make this for myself for ages – and this picture really inspires me to start to work on it. I’m actually working on a version of skirt # T1047 myself, in a medium weight purple wool. I hadn’t thought of making it actually in a two-tone color scheme. Below is another picture of the same skirt in a different color arrangement. Then there are hats! 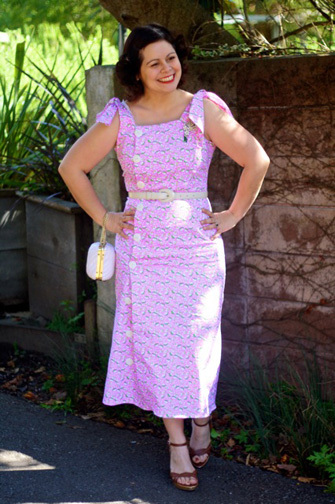 I never get tired of seeing what someone else does to personalize, and add their own creative touches to a pattern. The two photos below are from pattern # HW001.